Those who like to take selfies might be interested in the latest handset from ZTE, a smartphone that the Chinese company claims is the world's first with a 13-megapixel front-facing camera. Called the Nubia X6, the 6.4-inch smartphone has the latest Qualcomm Snapdragon 801 quad-core processor, and a massive 4250 mAh battery. In addition, it has two 13-megapixel cameras, one in the front, the other in the back. The X6 joins the growing number of 6-inch smartphones starting to appear on the market. It has a 1080p screen that packs in 344 pixels per inch. The aluminum-cased handset also has dual speakers, slots for two SIM cards, and comes in configurations with either 2 GB or 3 GB of RAM. Like other handset makers, ZTE is highlighting the phone's cameras as a way to attract consumers. The X6's rear-facing camera uses an "EXMOR RS" imaging sensor from Sony that helps it take pictures in low light levels -- to the point that it can capture clear photos of stars in the night sky. 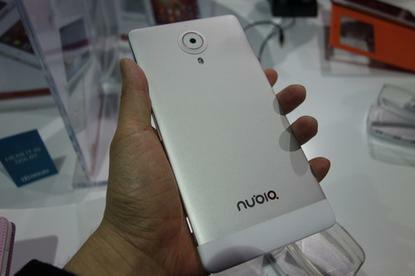 The phone runs Android 4.3 with ZTE's Nubia 2.0 user interface. ZTE incorporated a split screen function so that users can view separate apps at the same time on the large screen. The phone is the latest device to carry the Nubia name, a newly established brand ZTE hopes will distinguish itself in a market already crowded with rivals. To raise its profits, the company is increasingly developing more high-end devices at higher price points. ZTE will start selling the phone first in China, with pre-orders beginning on March 25. But the company will probably roll out the device to other markets later in the year, said a ZTE spokeswoman. The X6 starts at 2999 yuan (US$487) for the version with 2GB of RAM and 32 GB of flash storage. It will come in both a white and a gold version.